No experience in my estimation is as beautiful and as death-defying as carrying and delivering a baby. As women, we are miraculously able to carry and house another developing human for 9 months and then ensure its birth. Even now as I think about it, only God knows how such an feat is possible. In our human limitations, all we can do is enjoy it. That is why I love taking pictures of soon-to-be moms. With my camera, I am able to capture their hidden strengths and enduring perseverance as they make what is unimaginably difficult look sooo easy. Such was the case with my session with the Gilberts. Tiffany Gilbert (8 1/2 months pregnant) her husband Stephen, and the son Stephen III met me at the beautiful Allen Pond Park in Bowie, MD. It was hot that day and if you know anything about sessions in the sun during the summer, it is wise to be prepared for fussiness and a short gas tank of patience. However I was touched because Tiffany and her husband got through the session as easy as I have ever seen it. It was really one of those moments where you could tell just how much they love each other. As we made our way throughout the grounds, I was glad to see just how attentive and patient Stephen was as Tiffany took picture after picture. In the end, it was all worth it. We really got some great shots. One particular moment of note was when little Stephen put a stethoscope to his mother's belly to see if he could hear his little sister to be, Savannah. This was so precious. I must say that I enjoyed my time with the Gilberts. I left their session with two valuable lessons. First, as a photographer and customer servant, I will always be sure to carry water and a snack for outdoor maternity sessions and second, beauty is hard work. The Gilbert's were a beautiful family and I realize that that doesn't come easy. They had to work! Work to love each other, work to help each other, and work to put each other in a great light for great photos. Because of all the work that went into this, I know they will love the final results. Becoming a mother is one of the most awe-inspiring times that a woman can go through. All within the course of three trimesters, soon-to-be moms become increasingly aware of strengths they never knew existed and develop appreciations for themselves that they never would have imagined. Curves and shapes that would otherwise be overanalyzed and appropriately covered are now shown unabashedly. Emotions and thoughts that would otherwise be thought of as volcanic and far-reaching are now weighted and expected. Insecurities that were once deafening are now minimal (though still present). Such can be the journey to motherhood. I was reminded of this during my session with Deidre. It was a great experience capturing her and hearing her story. Normally during a maternity shoot, I spend a great deal of time going over clothing choices and discussing the best poses as to not highlight any insecurities. However with Deidre, I was free to do almost anything. Not only was she proud of her pregnancy, she was proud of herself; and I thought that was amazing. I can honestly say that seeing that level of freedom and self-acceptance encouraged me as both a woman and a photographer. For the first time in a while, I felt like I could just let the session be whatever it was going to be because there was nothing to be ashamed of on either side of the camera. One picture in particular was my favorite. I captured her sitting in a field in a high-split purple gown with a toned down wooded background. This shot to me was so regal and beautiful. We had great sunlight and despite the time of year, the weather was awesome. In addition, her hair looked great and you can tell that she was really comfortable. Overall, there were a lot of great shots from this session, but this picture by far was the most literal translation of womanhood, motherhood, and power in the entire gallery. Women, we are strong! We are powerful. God designed our bodies to help create, carry, and birth generations, and we should not be ashamed of them. Nothing about you should be hidden. We at Dee Jestene Photography pride ourselves in not only capturing amazing pictures but encouraging you that no matter who you are, we accept all that you are. So, from this day forward, we encourage you to do the same. Be strong; be courageous; be yourself. 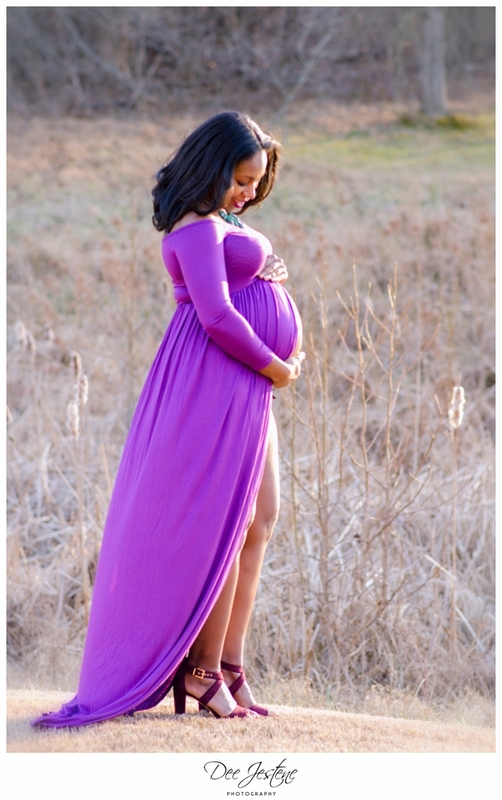 For more information on our maternity shoots, contact me at deejestene.com or connect with me on social media. Take care.